© 2019 Vascular Specialist International. Received November 27, 2018; Revised January 29, 2019; Accepted January 29, 2019. Deep vein thrombosis (DVT) is the third most common cause of cardiovascular morbidity and mortality. Anticoagulation has been the primary treatment modality for acute DVT. However, catheter-directed thrombolysis (CDT) has recently become widely accepted as an additional therapy to anticoagulation. We assessed comparative outcomes in patients with acute DVT who underwent anticoagulation therapy alone (ACA) group and those treated with CDT group. We retrospectively reviewed medical records of 149 patients with DVT from January 2011 to December 2015. We compared patients who received ACA group (n=120) and those who received CDT plus anticoagulation (CDT group, n=29). We analyzed the prevalence of lesions, thrombus removal rate in each lesion, and recurrence-free rate between the two groups. We found thrombus involvement in a total of 281 lesions in the ACA group and 85 lesions in the CDT group. For the distribution of lesions in each group, those in the femoral vein accounted for 34.2% of all lesions and those in the popliteal vein accounted for 31.7%. During follow-up, the overall thrombus removal rate was 91.1% in the ACA group and 87.0% in the CDT group (P=0.273). The recurrence-free rate was higher in the CDT group in a log-rank test; however, there was no statistically significant difference between the two groups (P=0.594). According to our results, there was no significant difference in thrombus removal and recurrence-free rates between the CDT and ACA groups. ACA still has an important role in the treatment of DVT. Venous thromboembolism (VTE), which includes deep vein thrombosis (DVT) and pulmonary embolism (PE), is the third most common medical cause of cardiovascular morbidity and mortality, after coronary artery occlusive disease and stroke [1,2]. Acute DVT occurs in about 5 per 10,000 population each year and is associated with substantial morbidity . The largest national population-based epidemiologic study in Asia, using data of the Korean Health Insurance system, revealed there is a significant increase in the incidence of DVT every year, particularly among people over 60 years of age . Anticoagulation therapy has been widely used and is recommended as the primary treatment modality for DVT. Anticoagulation effectively prevents thrombus extension, PE, recurrence, and death . In the American College of Chest Physicians guideline, long-term anticoagulation therapy alone (ACA) is strongly recommended over no such therapy in patients with DVT or PE. In addition, for acute proximal DVT of the leg, anticoagulation is still recommended over systemic thrombolysis or catheter-directed thrombolysis (CDT) for reasons of complexity, cost, and bleeding risk . Recently, Korean practice guidelines also specified that all patients diagnosed with lower extremity DVT require anticoagulation therapy to prevent recurrence and death, unless they have bleeding or a risk of bleeding . CDT was introduced to provide more rapid resolution of DVT. CDT facilitates selective thrombolysis through direct infusion of a thrombolytic agent into the affected vein. The first large, nationwide observational study to investigate comparative outcomes between CDT and conventional anticoagulation showed that patients who received CDT achieved improvement in venous functions owing to more rapid thrombus dissolution than patients who received conventional anticoagulation. However bleeding rate, inhospital mortality, duration of in-hospital stay, and hospital charges in the CDT group were still higher than those in the anticoagulation group . In this study, we compared clinical outcomes in patients with acute lower extremity DVT who underwent ACA and patients treated with CDT plus anticoagulation therapy. This study was a retrospective study that did not cause any harm to the study subjects; therefore, the requirement of informed consent was waived by the board. The study protocol was approved by the Institutional Review Board of Pusan National University Yangsan Hospital (05-2018-056). This study was a retrospective analysis of data collected from single-center registry. We reviewed the medical records of 149 patients with DVT from January 2011 to December 2015. Inclusion criteria were age >20 years, acute DVT with a first episode of swelling symptoms and symptom duration <14 days, and life expectancy >2 years. Exclusion criteria were as follows: uncontrolled hypertension, a history of stroke in the last 3 months, pregnancy or other concomitant chronic or potentially life-threatening disease, bleeding disorders, recent surgery, and gastrointestinal or other major bleeding event in the last 3 weeks. All patients had been initially evaluated and diagnosed with thrombus using computed tomography (CT) venography. Follow-up was performed every 3–6 months after discharge. Follow-up CT venography was conducted to evaluate thrombus removal within at least the initial 6 months and upon suspicion about the patency of venous flow. An inferior vena cava (IVC) filter was inserted via the right jugular vein at the beginning of anticoagulation therapy for 10 patients with thrombus in the IVC. All IVC filters were removed within 1 month after insertion. All patients were treated with compression stockings during hospitalization. Afterward, discharged patients were recommended to wear knee-length elastic compression stockings (Venex dur, micro light, 30–40 mmHg; Heinz Schiebler Norddeutsche Gummistrumpffabrik GmbH & Co. KG, Flensburg, Germany) and to take anticoagulation medication over 3 months. Patients were divided into two groups. One group received CDT, followed by anticoagulation drugs (the CDT group); the other group received anticoagulation treatment alone (ACA group). We compared the prevalence of lesions, the thrombus removal rate in each lesion, and the recurrence-free rate between the two groups during the 3-year follow-up period. We also observed patients for complications that occurred during their in-hospital stay. We applied anticoagulation in patients with acute DVT as soon as the diagnosis was confirmed with a CT scan. In accordance with a widely-used anticoagulation guideline , intravenous unfractionated heparin loading and continuous infusion were performed to attain a therapeutic activated partial thromboplastin (aPTT) that was 1.5–2.5 times the control aPTT. We then converted intravenous anticoagulation to oral anticoagulant, warfarin (Kuparin; Hana Pharm Co., Ltd., Hwaseong, Korea), with a target international normalized ratio of 2.0–3.0 in all patients [9–11]. All patients took warfarin for at least 6 months. We administered CDT to patients who had proximal lower extremity DVT, symptoms for ≤14 days, good functional status, life expectancy ≥2 years, and a low risk of bleeding. We started enoxaparin therapy (Clexane, Sanofi Winthrop Industrie SA; 1.0 mg/kg; Ambares, France), which is widely used as low-molecular-weight heparin, for all patients on the day of diagnosis with DVT, according to international guidelines [8–11]. The distal popliteal vein was punctured under local anesthesia using ultrasound guidance in the prone position. Next, an 8-Fr introducer sheath was inserted into the popliteal vein. A 0.035-inch hydrophilic guide wire was then navigated through the thrombotic segment, and a multiple sidehole infusion catheter (Cook Medical, Bloomington, IN, USA) was placed inside the thrombotic lesion. Subsequently, urokinase (600–1,200 U/kg/h) was administered for 24–48 hours using continuous infusion, and heparin was infused simultaneously through the access sheath to avoid thrombus formation. aPTT level was measured every 4 hours and maintained between 1.5 and 2.0 times the control level. Venography was performed after 24–48 hours to monitor thrombolysis . We used the chi-square test and Fisher’s exact test to compare categorical variables and the independent sample t-test for continuous variables. Several long-term results during the follow-up period were analyzed with the log-rank test. All statistical analyses were performed using IBM SPSS version 21.0 (IBM Corp., Armonk, NY, USA). A P-value <0.05 was considered statistically significant. Records of a total 149 patients were reviewed and divided into the CDT group (n=29) and ACA group (n=120). Table 1 presents patient characteristics. Mean ages was nearly the same in the CDT and ACA groups (57.8 vs. 58.0 years, respectively; P=0.894). Comorbid conditions such as hypertension, diabetes mellitus, smoking history, malignancy, and immobilization were also assessed in both groups. There was no significant difference in comorbid conditions between the two groups. Twenty-nine patients had thrombus involvement with a total of 85 lesions in the CDT group, and 120 patients had thrombus with a total of 281 lesions in the ACA group. Table 2 shows the proportion of thrombus by lesion in each group. In the ACA group, five patients (1.8%) had thrombus in the IVC, 53 patients (18.9%) in the iliac vein, 96 patients (34.2%) in the femoral vein, 89 patients (31.7%) in the popliteal vein, and 38 patients (13.5%) in the calf vein. In the CDT group, five patients (5.9%) had thrombus in the IVC, 17 patients (20.0%) in the iliac vein, 27 patients (31.8%) in the femoral vein, 27 patients (31.8%) in the popliteal vein, and 9 patients (10.6%) in the calf vein. Over 60% of lesions were in the femoral and popliteal veins in both groups. During the 3 years of follow-up, the overall thrombus removal rate was 91.1% (256/281) in the ACA group and 87.1% (74/85) in the CDT group (P=0.273). The removal rates of thrombus in each lesion were 100.0% (ACA, 5/5 patients) versus 80.0% (CDT, 4/5 patients) in the IVC, 86.8% (46/53) versus 94.1% (16/17) in the iliac vein, 91.7% (88/96) versus 88.9% (24/27) in the femoral vein, 91.0% (81/89) versus 77.8% (21/27) in the popliteal vein, and 100.0% (9/9) versus 94.7% (36/38) in the calf vein, respectively, and 100.0% (9/9) in the univariable analysis. However, there was no statistically significant difference (P<1.000, P<0.669, P<0.705, P<0.089, and P<1.000, respectively) (Table 3). The recurrence-free rates in the ACA group were 100.0% in 3 months, 98.1% in 6 months, 85.5% in 12 months, 79.4% in 2 years, and 63.8% in 3 years. The recurrence-free rates in the CDT group were 93.1% in 3 months, 89.4% in 6 months, 81.1% in 12 months, 74.3% in 2 years, and 74.3% in 3 years in the log-rank test. However, there was no significant difference between the two groups (P=0.594) (Fig. 1). There was no mortality during hospitalization. There were four cases of puncture-site bleeding that needed transfusion and bleeding control after CDT treatment, but there was no major bleeding, such as cerebral hemorrhage and gastrointestinal bleeding during the hospital stay. DVT of the lower limb is a global issue. First-time VTE is estimated to occur in about 250,000 white individuals annually in the United States. VTE is one of the leading causes of death. The 1-year mortality rate for DVT and PE in elderly patients is 21% and 39%, respectively. The incidence of VTE increases with the number of risk factors, which include older age, malignancy, surgery, trauma, inherited coagulation disorders, and immobilization . Virchow’s triad, venous stasis, vascular injury, and hypercoagulability are important factors in the development of VTE. Therefore, the goal of treating lower extremity DVT is to reduce the risk of fatal PE and mortality by correcting the three components of Virchow’s triad . Anticoagulation has an important role in reducing a hypercoagulable state. Anticoagulation therapy requires long-term treatment of more than 3 months and traditionally includes administration of a vitamin K antagonist, such as warfarin with heparin bridging . For cancer-associated VTE, low molecular weight heparin alone or in combination with warfarin had been the standard anticoagulation treatment for many years [16,17]. CDT is a new form of interventional therapy, which can directly transport thrombolytic drugs, such as urokinase, to the thrombus lesion using a multiple sidehole infusion catheter. Recently, increasing evidence shows that CDT results in early thrombus removal in lower-extremity DVT, prolongs venous patency, prevents the recurrence of DVT, and decreases the incidence of post-thrombotic syndrome (PTS) . In contrast, several studies have reported short-term results that invasive treatment, such as CDT could reduce the risk of PTS; however, long-term results were not determined and the complication of invasive treatment, such as vascular injury, was not possible to overcome . CDT is helpful for prompt relief of symptoms, but the 2-year results from one study demonstrated that CDT could not prevent PTS, compared with conventional anticoagulation; recurrence of VTE was higher, and rates of major or any bleeding were statistically higher in the CDT arm . According to our results, anticoagulation is not inferior to CDT. Despite differences in the duration and intensity of anticoagulation as well as the choice of anticoagulant according to patient, anticoagulation is essential in DVT treatment. Development of oral anticoagulants simplifies acute-phase treatment of DVT and may have an important role in preventing a hypercoagulable state. The development of new oral anticoagulants (NOACs) offers hope for more therapeutic anticoagulation options in DVT. The safety and efficacy profiles of these new agents, as compared with conventional anticoagulation therapy, are of paramount importance [20,21]. NOACs have a more predictable anticoagulant effect and were recently demonstrated to be as safe as warfarin, although they were administered in fixed doses without routine laboratory monitoring. In addition, NOACs do not require bridging therapy and have fewer drug interactions [2,22,23]. 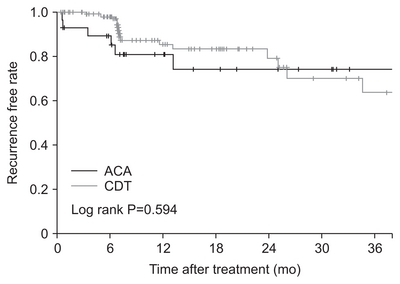 According to the thrombus removal rate and recurrence free rate, we did not find any significant differences of clinical importance between the CDT and ACA groups; however, evidence of more adverse events was noted in the CDT group. Although there were no deaths during hospitalization, four patients had active bleeding that required transfusion and bleeding control after CDT [1,24]. There were some limitations in our study. The evaluation of patients was retrospective and there was unavoidable selection bias. The sample size of the CDT group was very small compared with that of the ACA group. One of the important goals in DVT treatment is the prevention of PTS. However, the evaluation of PTS was difficult using our database. For that reason, we could not investigate PTS. These limitations could be overcome by conducting a large-scale prospective study in the near future. In conclusion, according to our results, the thrombus removal rate by lesion and recurrence-free rate in the ACA and CDT groups showed no significant difference. ACA still has a crucial role in the treatment of DVT. Fig. 1. Recurrence-free rate between patients who received anticoagulation therapy alone (ACA) and catheter-directed thrombolysis (CDT) during the follow-up period. Values are presented as mean (range) or number (%). ACA, anticoagulation treatment alone; CDT, catheter-directed thrombolysis; DM, diabetes mellitus; HTN, hypertension; CVA, cerebrovascular accident; CAOD, coronary artery occlusive disease. ACA, anticoagulation treatment alone; CDT, catheter-directed thrombolysis; IVC, inferior vena cava. Bashir R, Zack CJ, Zhao H, Comerota AJ, Bove AA. Comparative outcomes of catheter-directed thrombolysis plus anticoagulation vs anticoagulation alone to treat lower-extremity proximal deep vein thrombosis. JAMA Intern Med 2014;174:1494-1501. Streiff MB, Agnelli G, Connors JM, Crowther M, Eichinger S, Lopes RD, et al. Erratum to: Guidance for the treatment of deep vein thrombosis and pulmonary embolism. J Thromb Thrombolysis 2016;41:548. White RH. The epidemiology of venous thromboembolism. Circulation 2003;107:I4-I8. Jang MJ, Bang SM, Oh D. Incidence of venous thromboembolism in Korea: from the Health Insurance Review and Assessment Service database. J Thromb Haemost 2011;9:85-91. Enden T, Haig Y, Kløw NE, Slagsvold CE, Sandvik L, Ghanima W, et al. Long-term outcome after additional catheter-directed thrombolysis versus standard treatment for acute iliofemoral deep vein thrombosis (the CaVenT study): a randomised controlled trial. Lancet 2012;379:31-38. Kearon C, Akl EA, Ornelas J, Blaivas A, Jimenez D, Bounameaux H, et al. Antithrombotic therapy for VTE disease: CHEST guideline and expert panel report. Chest 2016;149:315-352. Min SK, Kim YH, Joh JH, Kang JM, Park UJ, Kim HK, et al. Diagnosis and treatment of lower extremity deep vein thrombosis: Korean practice guidelines. Vasc Spec Int 2016;32:77-104. Hirsh J, Guyatt G, Albers GW, Harrington R, Schünemann HJ. Antithrombotic and thrombolytic therapy: American College of Chest Physicians evidence-based clinical practice guidelines (8th Edition). Chest 2008;133:110S-112S. Hull RD, Raskob GE, Rosenbloom D, Lemaire J, Pineo GF, Baylis B, et al. Optimal therapeutic level of heparin therapy in patients with venous thrombosis. Arch Intern Med 1992;152:1589-1595. Raschke RA, Reilly BM, Guidry JR, Fontana JR, Srinivas S. The weight-based heparin dosing nomogram compared with a standard care nomogram. A randomized controlled trial. Ann Intern Med 1993;119:874-881. Kurtoglu M, Koksoy C, Hasan E, Akcalı Y, Karabay O, Filizcan U. Long-term efficacy and safety of once-daily enoxaparin plus warfarin for the outpatient ambulatory treatment of lower-limb deep vein thrombosis in the TROMBOTEK trial. J Vasc Surg 2010;52:1262-1270. Kuo TT, Huang CY, Hsu CP, Lee CY. Catheter-directed thrombolysis and pharmacomechanical thrombectomy improve midterm outcome in acute iliofemoral deep vein thrombosis. J Chin Med Assoc 2017;80:72-79. Rosendaal FR. Thrombosis in the young: epidemiology and risk factors. A focus on venous thrombosis. Thromb Haemost 1997;78:1-6. Kesieme E, Kesieme C, Jebbin N, Irekpita E, Dongo A. Deep vein thrombosis: a clinical review. J Blood Med 2011;2:59-69. Daskalopoulos ME, Daskalopoulou SS, Tzortzis E, Sfiridis P, Nikolaou A, Dimitroulis D, et al. Long-term treatment of deep venous thrombosis with a low molecular weight heparin (tinzaparin): a prospective randomized trial. Eur J Vasc Endovasc Surg 2005;29:638-650. Streiff MB, Holmstrom B, Angelini D, Ashrani A, Bockenstedt PL, Chesney C, et al. NCCN guidelines insights: cancer-associated venous thromboembolic disease, version 2.2018. J Natl Compr Canc Netw 2018;16:1289-1303. Frere C, Benzidia I, Marjanovic Z, Farge D. Recent advances in the management of cancer-associated thrombosis: new hopes but new challenges. Cancers (Basel) 2019;11:E71. Li Q, Yu Z, Wang J, Chen X, Li L. Long-term prognostic analysis of early interventional therapy for lower extremity deep venous thrombosis. Exp Ther Med 2016;12:3545-3548. Lu Y, Chen L, Chen J, Tang T. Catheter-directed thrombolysis versus standard anticoagulation for acute lower extremity deep vein thrombosis: a meta-analysis of clinical trials. Clin Appl Thromb Hemost 2018;24:1134-1143. Stone J, Hangge P, Albadawi H, Wallace A, Shamoun F, Knuttien MG, et al. Deep vein thrombosis: pathogenesis, diagnosis, and medical management. Cardiovasc Diagn Ther 2017;7:S276-S284. Lenchus JD, Biehl M, Cabrera J, Moraes AG, Dezfulian C. In-hospital management and follow-up treatment of venous thromboembolism: focus on new and emerging treatments. J Intensive Care Med 2017;32:299-311. Holbrook A, Schulman S, Witt DM, Vandvik PO, Fish J, Kovacs MJ, et al. Evidence-based management of anticoagulant therapy: antithrombotic therapy and prevention of thrombosis, 9th ed: American College of Chest Physicians evidence-based clinical practice guidelines. Chest 2012;141:e152S-e184S. Vo T, Vazquez S, Rondina MT. Current state of anticoagulants to treat deep venous thrombosis. Curr Cardiol Rep 2014;16:463. Kim IS, Jo WM. The role of pharmacomechanical endovascular intervention for iliofemoral vein thrombosis compared to conventional anticoagulation therapy. J Korean Med Sci 2017;32:47-53. Copyright © 2013 Vascular Specialist International. All Rights Reserved.